1. All homeowners are advised to familiarize themselves and their children with all pool rules. Parents are responsible for their children under all circumstances. 2. The pool is to be used exclusively for DeerLake homeowners and their guests. 3. The pool and surrounding area may not be reserved for exclusive use, with the exception of Swim Team practices and meets. 4. Only homeowners in good standing are allowed at the pool. 5. 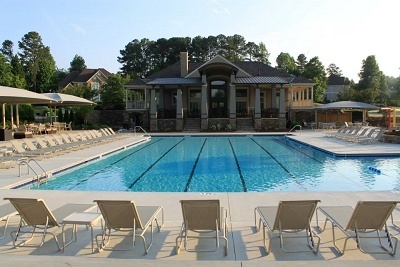 In using the pool, homeowners and guests must be considerate of others enjoying the facility. Examples of behavior that would interfere with the enjoyment of the facilities by others include exuberant/boisterous play, use of abusive or offensive language, apparent intoxication or destruction of property. 6. In using the pool, homeowners and guests assume all liability. 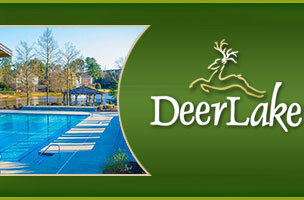 The DeerLake Homeowners Association assumes no responsibility or liability for anyone using the pool. This includes the loss or damage of personal property while at or using the pool. 7. These rules are designed to ensure a safe and enjoyable recreational experience for all homeowners and their guests. In addition, these rules are designed to protect the assets of the community for which all DeerLake residents are ultimately financially responsible. Violation of these rules, therefore, cannot be allowed. Enforcement of these rules is the responsibility of all the members and the lifeguard on duty. Repeated rule breaking will be escalated to the DeerLake Board of Directors for disciplinary action as required to ensure compliance. Infraction of any pool rule may result in fines and suspension of pool privileges at the discretion of the Board of Directors. 1. Lifeguards are on duty daily during the summer from 11am - 9pm Monday - Friday and 10am - 9pm Saturday and Sunday. Before or after the posted hours, there is no lifeguard on duty. Those choosing to swim at this time do so at their own risk. NOBODY UNDER 18 WILL NE ALLOWED IN THE POOL AREA WHEN THERE IS NO LIFEGUARD ON DUTY. 2. The pool and surrounding area will be closed during inclement weather. There is a twenty (20) minute mandatory closing for every time it thunders and/or lightening. 3. During peak hours, there is fifteen (15) minutes set aside from quarter till to top of the hour. This time is reserved for adult swimming and a required rest period for children. No one under the age of eighteen (18) will be allowed in the pool at this time. 4. Management reserves the right to set aside designated time during hours of normal operation for special events or programs. 1. The gate to the pool area must be closed at all times. 2. NO GLASS CONTAINERS, BREAKABLE CONTAINERS, or chewing gum allowed in the pool area. Glass and breakable containers are strictly prohibited. 3. Prior to leaving the pool area all trash must be placed in the poolside trash receptacles provided. Plastic wrappers, plastic covers from straws on juice boxes, etc. must be placed in trash cans immediately in order to keep them out of the pool and the filter system. 4. Children age ten (10) and under are NOT permitted in the pool area unless accompanied by a parent or a person fifteen (15) years of age or older who will assume responsibility for the child�s safety and behavior. 5. Children between the ages of eleven (11) and fourteen (14) will be granted unaccompanied pool privileges if the lifeguard feels confident in the child�s swimming ability. 6. The wading pool is for the enjoyment of small children only. Children over the age six (6) are not allowed in the wading pool. Parents are responsible for and must accompany their children while in the wading pool area. THE LIFEGUARD DOES NOT MONITOR THE WADING POOL. 7. Water wings, vests, children�s small floats, snorkel tubes, face masks, kick boards, flippers and �nerf� type balls under 12� in diameter are permitted. Other floatation devices may be used at the discretion of the lifeguard based upon occupancy of the pool. 9. No one except for certified lifeguards are allowed to climb, sit or in any way use the lifeguard chairs, life preservers, or other lifesaving safety or pool equipment. 10. Radios, CD players and/or iPods with speakers, etc. must be kept at minimum volume levels. 11. No pets, bicycles, skateboards, skates or other vehicles are allowed in the pool area. 12. No food is permitted within 6 feet of the pool edge. No drinks are allowed in the pool. 13. Reservation of pool chairs and tables when not in the pool area is prohibited. 14. The pool furniture is not to be used outside the pool area. 1. Please try to remember to gather all of your belongings when leaving the pool. 2. In order to minimize lost items write your name on your belongings. 3. Anything left more the five (5) days will be DONATED! 1. All persons must wear suitable bathing attire while swimming. Cutoffs or shorts with belts are not allowed. a) Swimming with contagious diseases or infectious conditions, including blisters or cuts is prohibited. b) Showering after heavy perspiration is required before entering the pool. c) Any children not fully potty trained must wear swim diapers covered with plastic or rubber pants. In the event of an accident, the pool must close for a substantial period of time.